During our time in Utah, we found a "diamond in the rough" if you will. Located northeast of Ogden, you will find a beautiful little reservoir that doesn't allow motor crafts on the water. If that isn't reason enough to visit, we've brought you our top 5. Causey Reservoir is located in a relatively remote area. (We did not have any phone service while there.) The drive is beautiful and gives you a great view of the mountains and creeks aligning the area. As long as you pack everything you will need for the day, it's well worth the trip. Causey will be the only thing around so it is quiet, peaceful, and everyone there is enjoying it with you. The main reason we decided to go to Causey was that it is a non-wake reservoir. Meaning you won't find any powerboats flying around. This makes it ideal for Kayaking, SUP, canoeing, cliff jumping, and swimming. There is a beautiful hike that explores the south side of the reservoir. At just under 5 miles total, it is an easy hike with wonderful views of the surrounding area. It is an easy, shaded trail with no turnoffs. Dogs are also allowed! When you reach the river you will find a nice little camping spot, which leads us to our next reason. Bring your day packs, hike the Skull Creek Trail (or kayak up the river) and camp! There is a great little camping area nestled at the end of the river with tree shelter all around. Yep, that's right. For anyone looking to fly fish or see some wild salmon, this is the spot. Throughout the late summer and fall, wild pink salmon will be swimming in the river. We saw quite a bit on our trip in September! Well, there you have it. 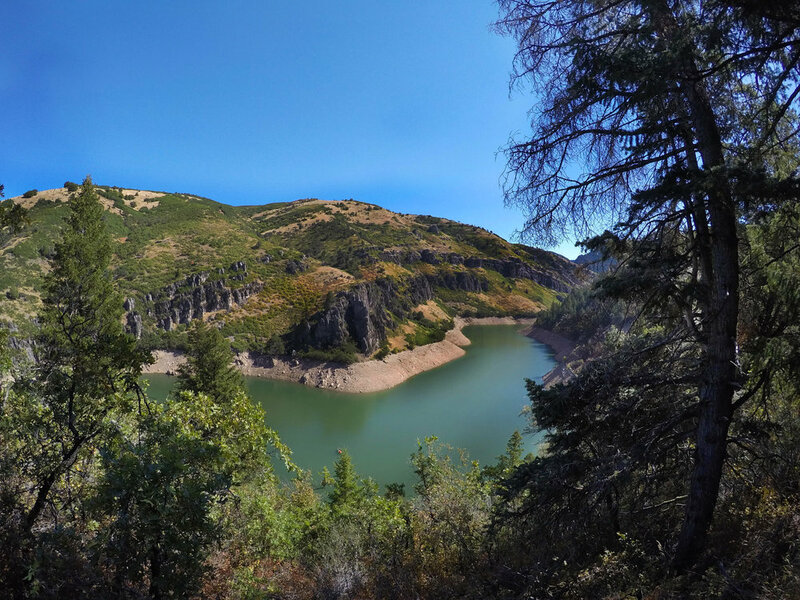 Those are our top 5 reasons to visit Causey Reservoir, we hope you get out there and give it a shot in the near future!